NEWFOUNDLAND – Anaconda Mining of Toronto is making an all-share bid to acquire all the issued and outstanding common shares of Maritime Resources Corp. of Vancouver. Anaconda is offering $0.14 per Maritime share, a premium of 40% to the Maritime closing price on March 16, 2018. The price is also a 44% premium to the volume weighted average Maritime trading price of $0.097. Anaconda submitted its original proposal to Maritime on Jan. 29, but has been unable to discuss the matter with Maritime’s management. In response to the Anaconda’s advances, Maritime implemented a shareholders’ rights plan. In taking its bid directly to the Maritime shareholders, Anaconda pointed out many benefits they would enjoy by tendering their shares, not the least of which is accelerated reopening of Maritime’s Hammerdown mine and development of the Orion gold deposit 14 km northwest of Springdale. Hammerdown operated from 2000 to 2004 and could quickly be reopened. Capital costs of developing the two Maritime properties would be substantially less because the ore could be treated at Anaconda’s Pine Cove mill and tailings facility. Anaconda also says it has greater market presence, enhanced liquidity and a broader capital markets profile. 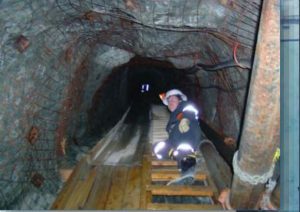 The new enterprise would enjoy the cash flow of Anaconda’s Point Rousse gold project near Baie Verte, N.L. Details of the offer are available at www.AnacondaMining.com.